Mobile pellet plant, or mobile small pellet plant, MPL300 and 400, are our new small biomass pellets production lines that includes all necessary equipment. This small multifunction integrated wood pellet plant is specially designed for medium scale pellets production. The capacity of this small mobile wood pellet plant ranges from 250-600kg/h. With a simple and elegant structure design, this mobile small pellet plant is especially efficient in making pellets. GEMCO mobile pelletizing equipment can process a wide varieties of raw materials including logs, saw dust, wood shavings, crop straw, mixed feed, rice husks, sawdust, corn stalk, cotton stalk, twigs, wood chips, wood shavings and other wooden materials, alfalfa, bagasse, and peanut shell, etc. Mobile small pellet plant is composed of hammer mill, cyclone separator, mixing bin, water tank, screw conveyor, wood pellet mill, vibrating screen, scraper conveyor, electric cabinet, and foundation frame. The water tank is next to the vibrating screen to adjust moisture. When the water tank is fulk with water, the pump motor will start. Filtering water can be controlled by the adjusting button according to your needs. First, the wood hammer mill in the mobile pelletizing equipment crushes raw materials into suitable size. Then the screw conveyor feed the material powder into the hopper. The material gets molded in the pellet making system and becomes well-shaped pellets. Next, the pellets are transmitted into the cooling and sieving machine. After that, the pellets are ready to be packaged and sold. The dust generated during the whole process is gathered in the dust collector. 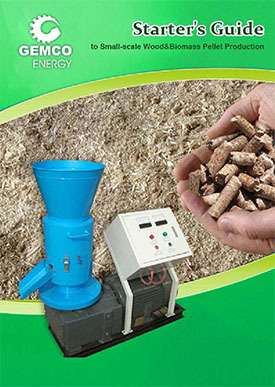 Mobile small integrated wood pellet plant takes smaller room and it is more convenient for movement and transportation. We can set wheels for mobile small pellet plant if you need, which make it more easy to move around. The maximum height of this mobile pelletizing equipment has been reduced, it takes only a little room and it is more convenient for transportation. Wide Application. 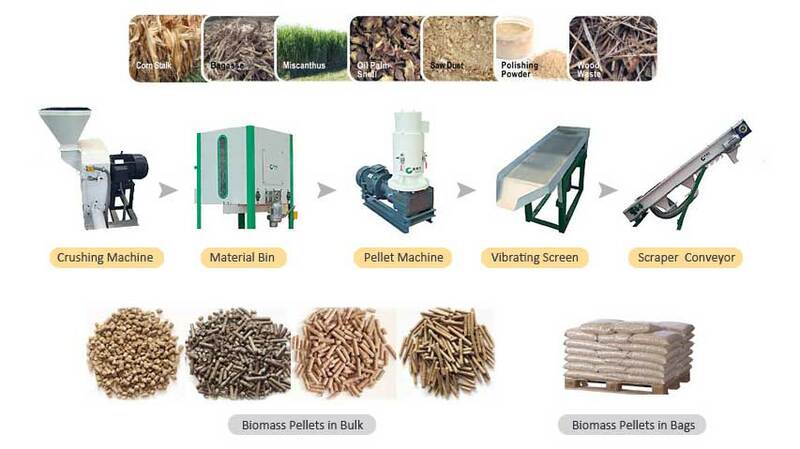 Mobile small pellet plant can process all kinds of biomass materials including wood fiber, such as peanut bagasse, shell, straw, sawdust, bamboo, castor shell, coffee grounds, rice husk, wheat-straw, cotton stalk, sunflower shell, tobacco residue, dregs of decoction, leaf mustard stalk, jute residue, tea residue, wood waste, bean shell, coconut shell, and palm shell, etc. Mobile pellet plant is full-automatic because of its PLC control system. Just push one button, this mobile small pellet plant can make pellets for you in pack. All the electrical parts in this mobile small pellet plant are from the Schneider, they are in reliable quality. To ensure continuous production, the frequency conversion motors are installed in the feeder and screw conveyor to adjust the feeding speed. A: How operate this mobile small pellet mill exactly? Q: Please view the video and get to know.